We stayed the night before the cruise in a Miami hotel and had supper at a buffalo wings restaurant. They did all different types of wings imaginable. After supper we went back to the hotel, watched a little bit of T.V whilst we eagerly awaited the cruise. We woke up early this morning, had some complementary breakfast and went to the Airport before going to the port, this way we could already check in prior to going to the dock and save us a lot of waiting. 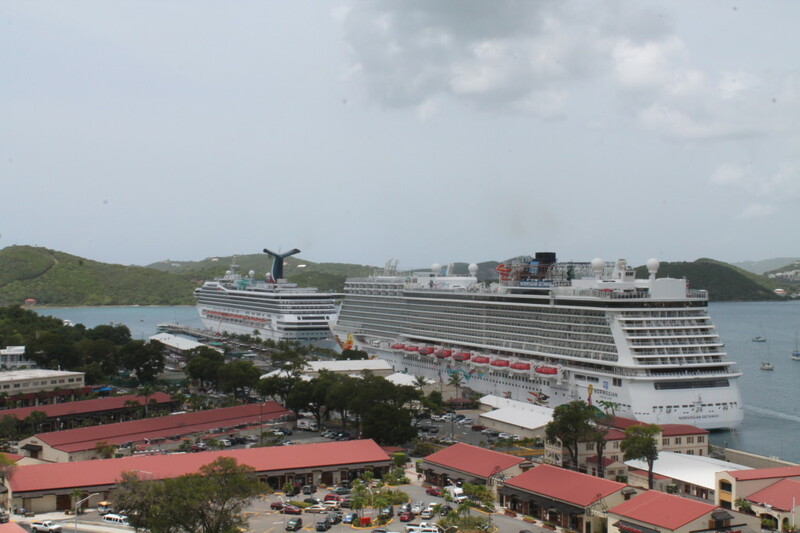 We got to the port and got onto the cruise ship, The Carnival Conquest. 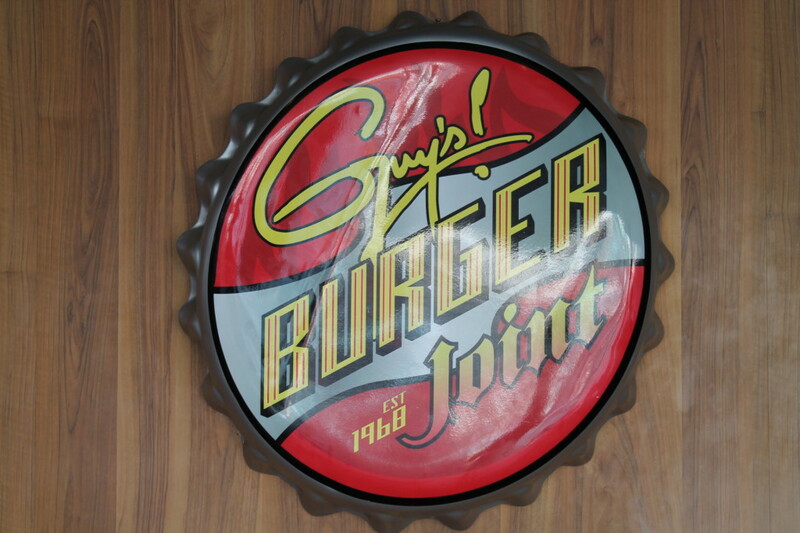 The first thing we did once on board, was have a burger from Guy Fieri’s Burger Joint, a conveniently located burger restaurant on board next to the pool with a whole selection of different toppings. I had to make a promise to myself that I would only have 1 the entire cruise, it was difficult but I managed. Dad had signed Cameron and I up for the Bottomless Bubbles package, which is basically unlimited drinks, Cameron made really good use of it, I however did not, so I didn’t take the package for the second week. 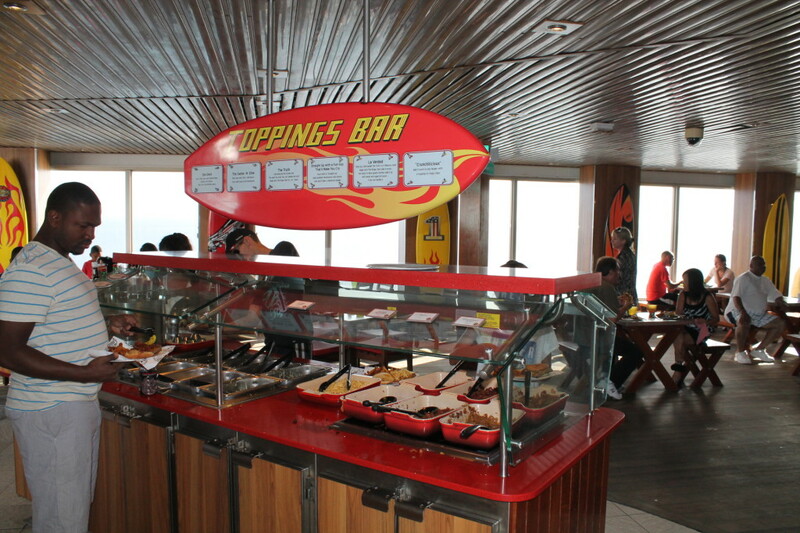 We all agreed pretty much as soon as we arrived on the ship that the food had definitely improved in its quality and presentation, along with portion sizes. The food was really, really good. It was really a treat, as Mom didn’t have to cook and we were getting our veggies and our protein which I think we all took advantage of. The cabins we were assigned was really nice and spacious, bigger than what we all expected, with an inter-leading door to Mom and Dad’s room. We had a mustering drill at about half past 3 in the afternoon, it was really hot and humid in Miami so this was a little bit unpleasant. None the less it was over really quickly and then the relaxing could commence. We all unpacked and went for our early seating supper in the Renoir Restaurant. We met our waiters for the next three weeks, Stephens (from St Vincent), Syafei (from Indonesia) and Durgun (from Turkey) Really nice, friendly and accommodating staff who are a true asset to the company. Cameron and I went back to the room watched a bit of TV then hit the hay: we were eagerly awaiting the Bahamas in the morning. We spent the entire day in the ocean getting nice tans, taking pics and playing with the football. I forgot to put on sun screen and got quite a burn which eventually peeled, but it was worth it. Cameron and I went back on the boat a little bit early so that we could have lunch. Cameron had guy’s burgers and I had the buffet. Later that afternoon we got ready for supper after a long day ashore. We had it in the dining room once again and the food was really good. Today was our first sea day and our first Formal Evening. Every Formal evening took place on the sea day. We spent the day relaxing, Cameron and I played ping pong. We also were able to have brunch, which had some wacky things on the menu, such as Cereal crusted French Toast and a breakfast quesadilla. For supper we got all dressed up in our fancy attire. The food on the menu was a little bit more upmarket, with lobster on it, along with amazing fillet. The food was really good, I had more than one helping of lobster. Once our tummies were full it was off to bed to wake up early for St.Thomas. 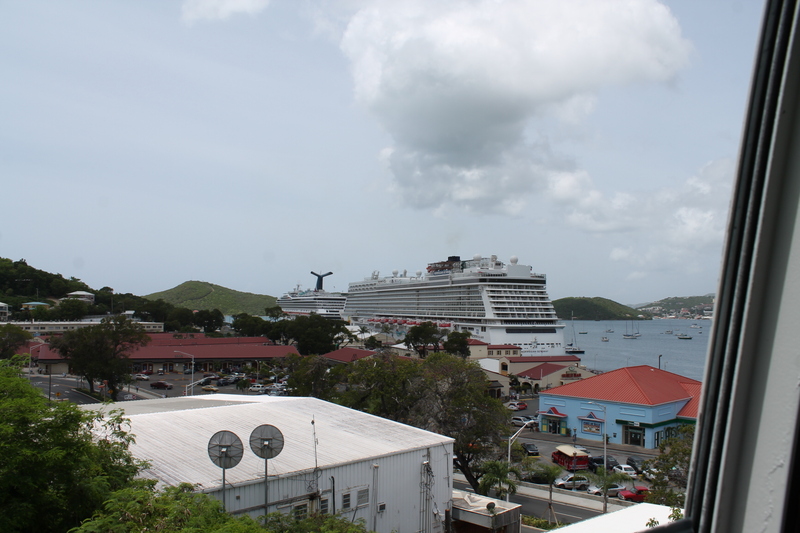 In St.Thomas we got off the ship and walked into the commercial area of town where all the port shops were. We had a look around and then headed to a cable car, similar to the one in Madeira. 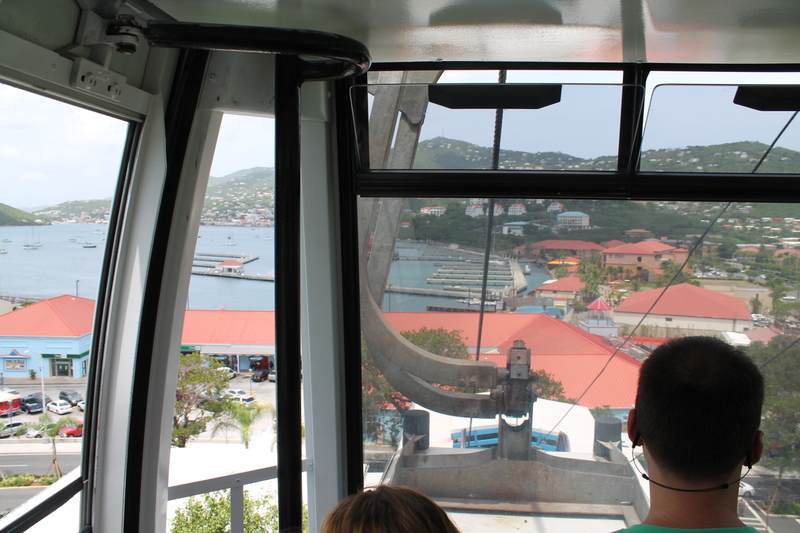 It takes its passengers to the top of the mountain where you get incredible views of the entire island. We had a drink at the top, took some photos all before heading back down. Once down we took a taxi into the center of St.Thomas town, where we walked around a market, then down long streets before eventually stopping for lunch at a Mexican restaurant. Very good food, but a little pricey, I mean R30 for guacamole is a little bit much, but it was worth it. After lunch we headed back to the ship. 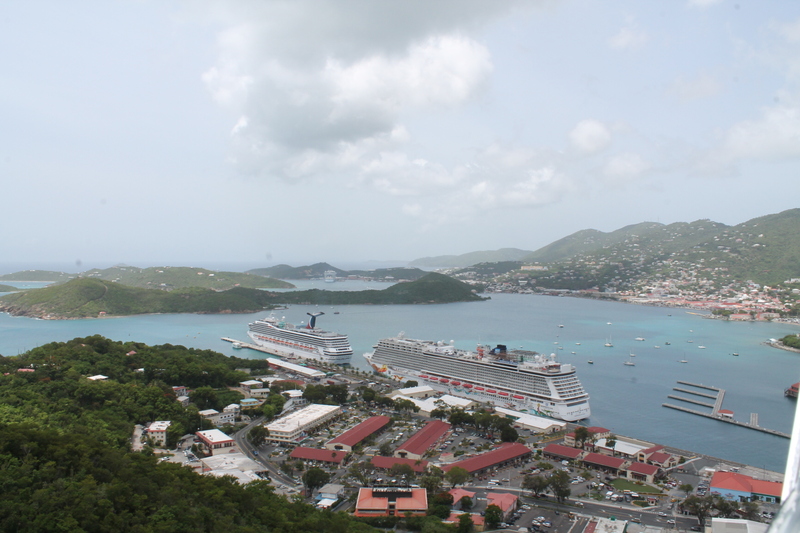 As we “set sail”, we waved St.Thomas goodbye as we were headed for San Juan. 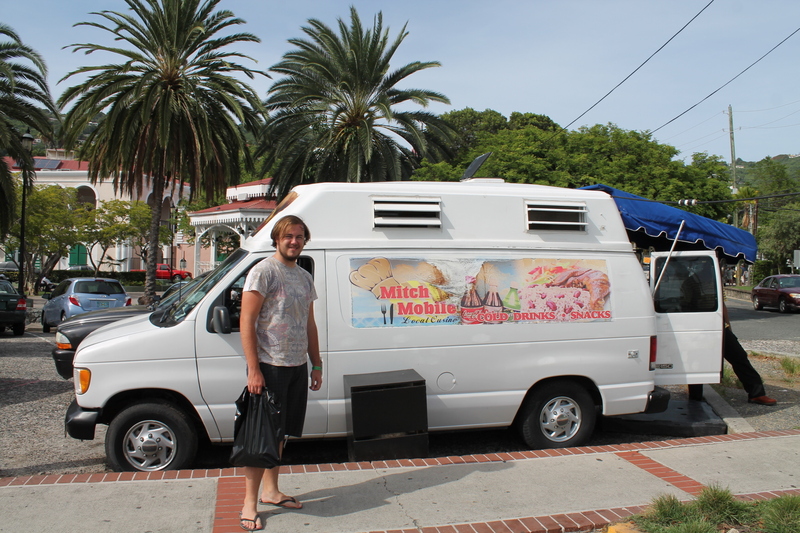 When I was 9 and we visited St.Thomas we saw a Mitch mobile van that had snacks etc. in it. We took a picture of the van in 2004 – the picture is at home. Strangely enough, we saw the same van again this time! The lady, Mitch, has been running the business since we were last there and I even got to meet her. She just loved the idea that I popped in to say hello. We woke up early once again, went for breakfast, and on the way back to our cabin we witnessed a little bit of drama. 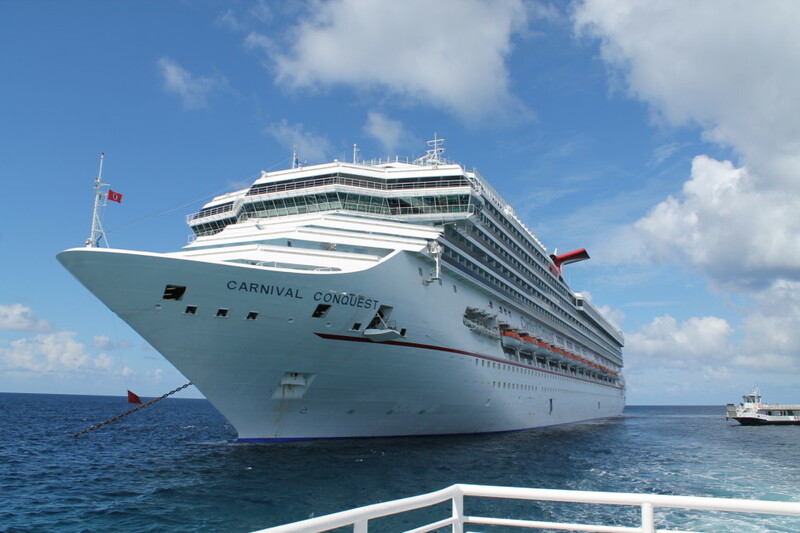 People were ‘apparently’ smoking dope in one of the cabins – there was a K9 unit that sniffed it, it was quite exciting, they were escorted off the ship and most likely went to jail. After an exciting start to the day we walked into San Juan, went to a whole bunch of different shops from Del Sol to Guess, to a local convenient store. We had a light lunch at the “birth place of the mojito”, where a very insightful student knew we were from South Africa, knew about Trevor Noah and South Africa’s culture. Throughout the entire trip he has been the only person who knows a lot about SA. 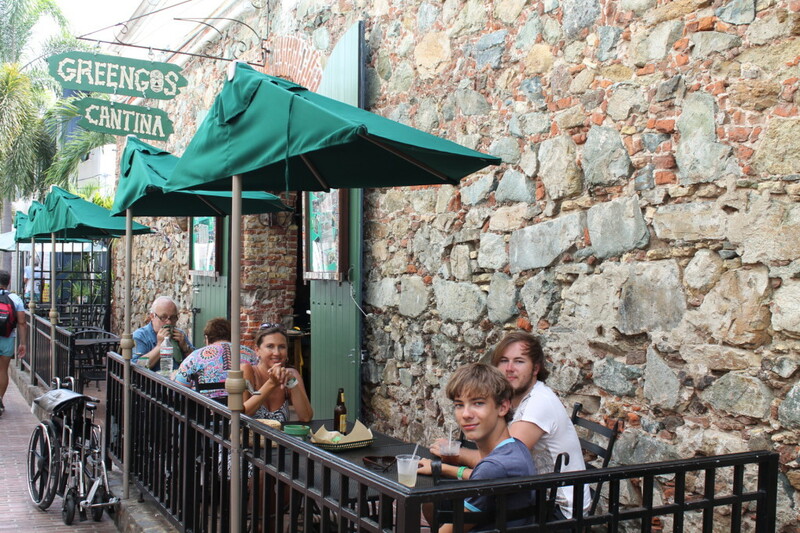 Once we had had a light lunch we meandered back to the boat, before leaving San Juan at 6pm into the sunset. 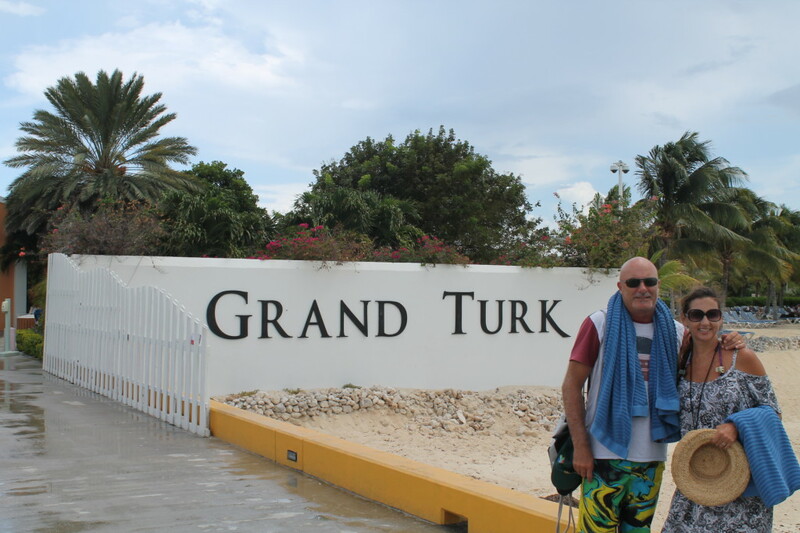 Grand Turk is the third largest barrier reef in the world. 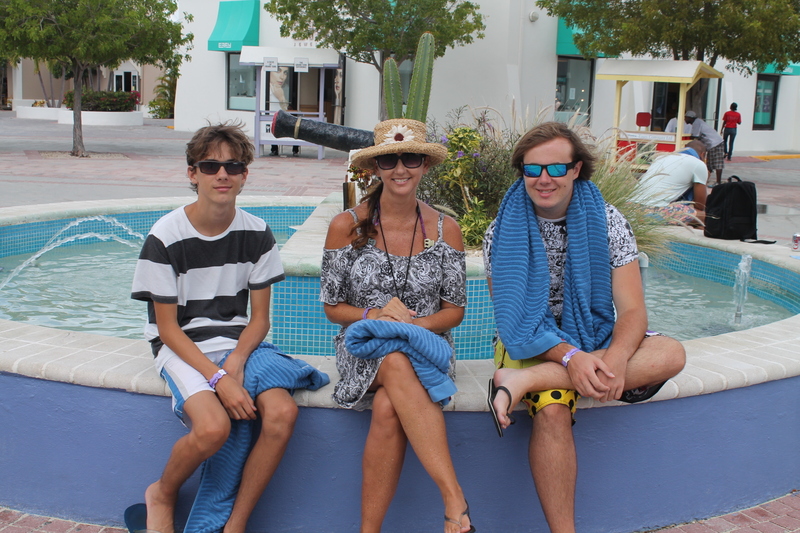 Today we had booked a shore excursion, to Power Snorkel. It is an underwater torpedo looking device that allows you to snorkel without having to move a muscle whilst you get propelled. “The lazy mans snorkeling” as its known. Once we were done we went back to the ship – we would have liked to have spent more time at the beach, but we didn’t have the option. 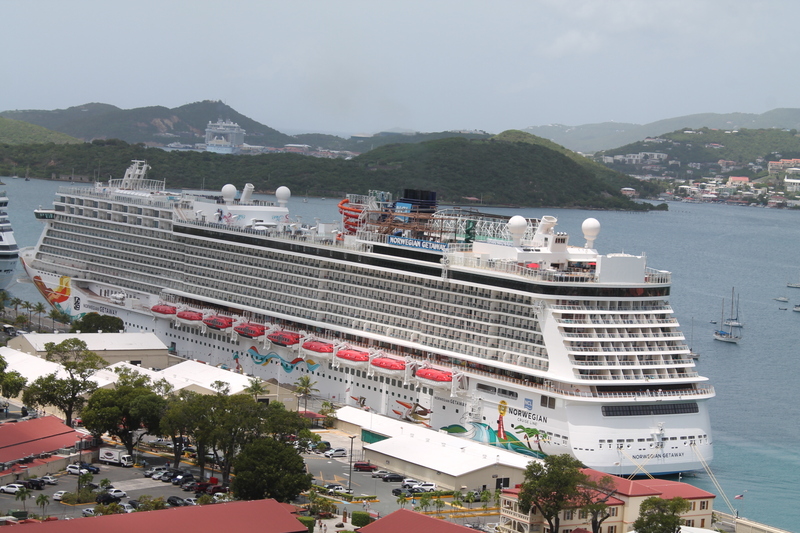 Regardless, we never do shore excursions through the cruiseline, this was our first one, and we have to recommend it. It really was an exciting adventure, not to mention we actually got to see a lot of fish which is always a plus when going snorkeling. Today we had brunch once again, and we had a relaxing day. Dad allowed me to go gambling with him as the age is 18 on board the cruise ship. Didn’t win anything but it was a fun experience. In order for us to stay on the ship for another week we had to get off the ship briefly and then re-board all before the other 3000 people get on board. 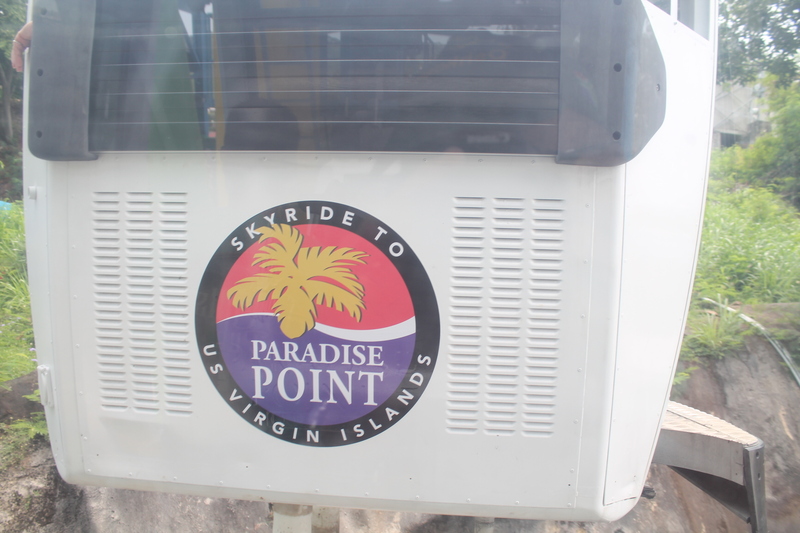 It was a relatively fast process, it’s called back-to-back cruising and there were about 15 of us doing it. They gave us champagne when we embarked and took photos of us as a group. We still had to change rooms so we did that first thing this morning. We had the ship to ourselves for around an hour before the next cruisers boarded. We were just amazed at how much time they give the cabin staff to prep for the new arrivals. We had lunch at the buffet and awaited the new arrivals before doing the mustering again and setting sail for another 7 days. Yippeeee! There was a great deck party as we left Miami again – they really know how to get the vibe going! Mom and Dad let us sleep in this morning and we met up with them for brunch again. We had a relaxing day, Cameron had found friends and was playing with them, I just did my own thing. Today we got off the ship, walked around the port, Cameron and I found wifi, so we spoke to our friends who we are really missing. 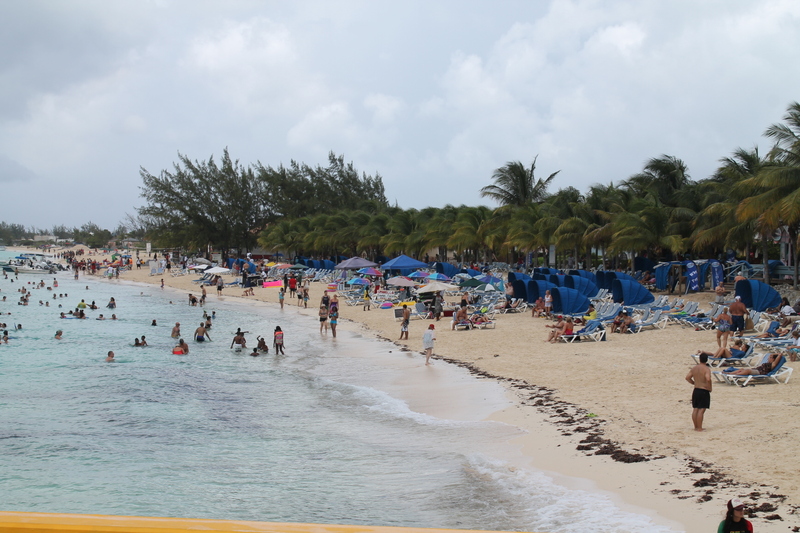 We then got into a taxi and went to the city center of Cozumel. 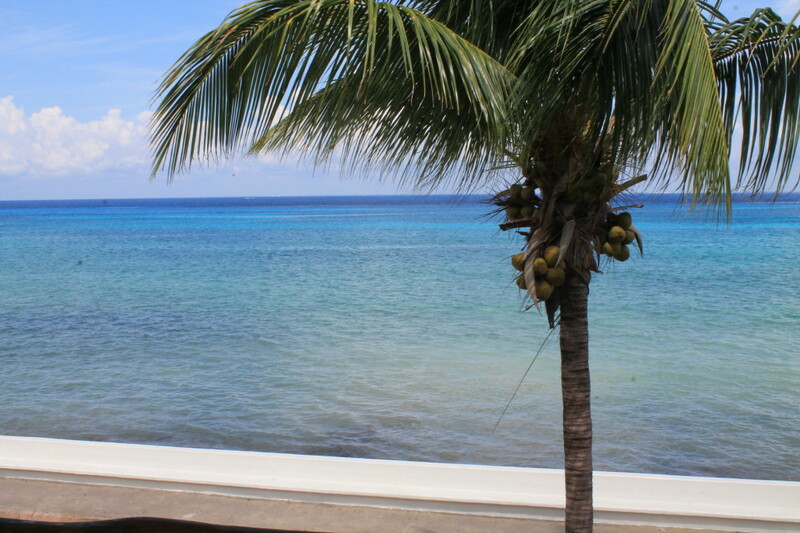 We meandered down all of the streets, walking past jewelry shops, and curios shops until we finally found a place to have lunch that had a nice view of the sea – we could even see Cancun in the distance. 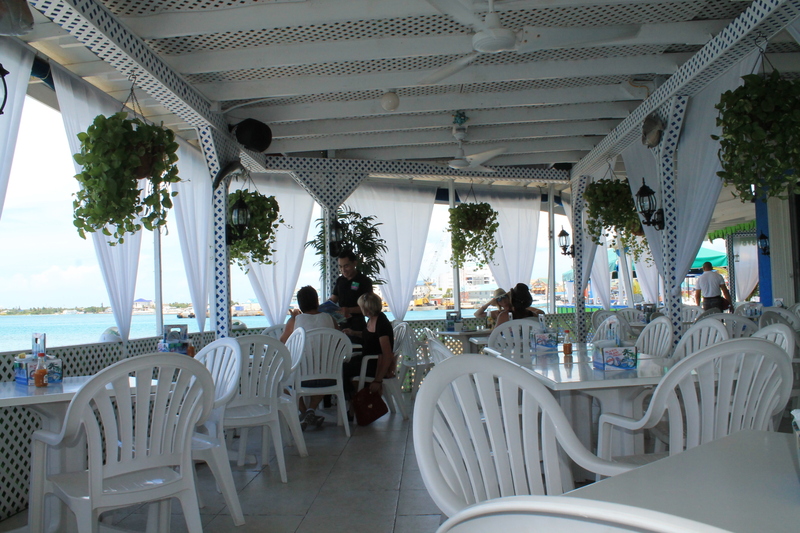 The restaurant had beach sand under the table, even upstairs where we sat. Lunch was really good, a little bit pricey but good none the less. Once we had had lunch we were looking for a place for Dad and I to go jet skiing but our search came up empty. Cameron and I went back on board at about 2 o’clock, Mom and Dad stayed on shore for a little bit longer. This picture of Dad and Cameron is also a milestone. On one of our first visits to Cozumel when Cameron was about 10 months old, Mom took a picture of Dad who had Cameron on his lap. Cameron was holding Dad’s Corona and sucking on the empty bottle. Look at him now! For the record, that is Mom’s beer so no need to panic people! The day came to a close with a nice supper at the dining room, we had a very exciting day planned for the next day and that meant an early start which also meant an early bed time. Belize has the second largest barrier reef in the world, the first being The Great Barrier Reef in Australia so naturally we wanted to do some snorkeling. Once again we booked through the ship and this specific tour was highly recommended. The tour boat that took us to the snorkeling picked us up from the ship itself which was great. Today was a tender anyway so it was great leaving directly from the ship to the small snorkeling boat. 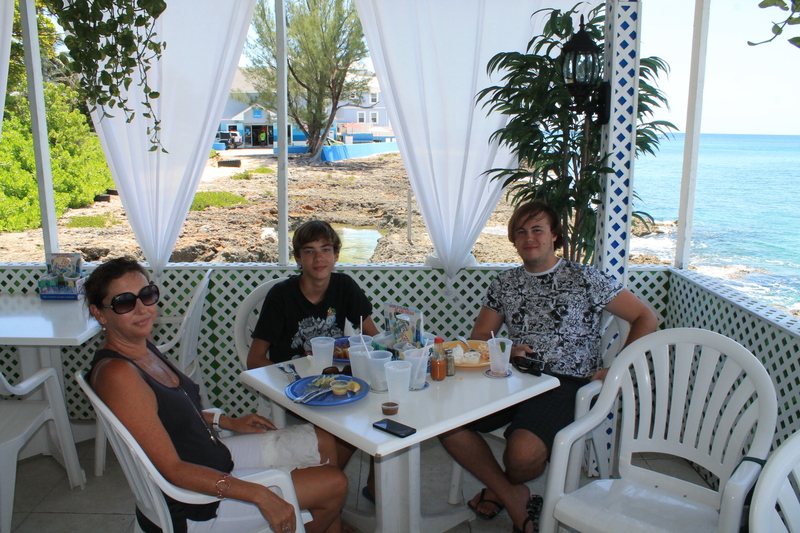 We went on the boat to a small island where they had accommodation, a cafe and a dive shop. 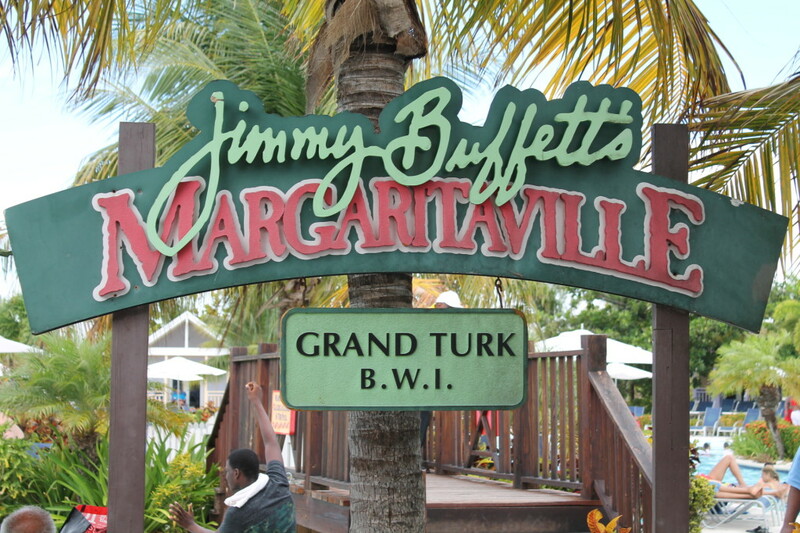 That’s where we signed all of our waivers and got our gear to go snorkeling. They took us out to a place that used to be an island until a huge hurricane hit and wiped it out – the remains encourage a lot of sea life. We saw the most fish we had ever seen whilst snorkeling and the professional guide was amazing. However after using the power snorkels last week, this was a little bit more demanding, but we coped. We saw from a lobster to a whole array of different fish. Unfortunately a lot of the footage didn’t come out too well as ‘somebody’ fiddled with the camera settings! Once we were done with the snorkeling the weather was starting to turn pretty bad, so we had to rush back to ship in order to avoid the electric storm. We were thinking of going to Belize itself, but because of the weather we weren’t so sure it would be pleasant. It was a really fun day – we had never seen that many fish, and we now needed some rest. We had supper in the dining room and went straight to bed. Today was a beach day so Mom and Dad allowed us to sleep in and walk to the beach when we were ready. The beach was lovely and everyone was on it. Now Mom, as we all know can’t handle too much alcohol, as with most woman, lets just say her drink of choice today was something called a Hurricane. A Hurricane for those who don’t know what they are, is 3 parts rum to 1 part fruit juice, in a large cocktail glass. Mom had three of them, and needless to say she was pretty um, can I say drunk? Dad also had a number of these and together they created a storm! Mom and Dad were the only two in the water by the time the ship was ready to leave. Dad decided that doing handstands in the water with his glasses and peak on his head was a good idea. 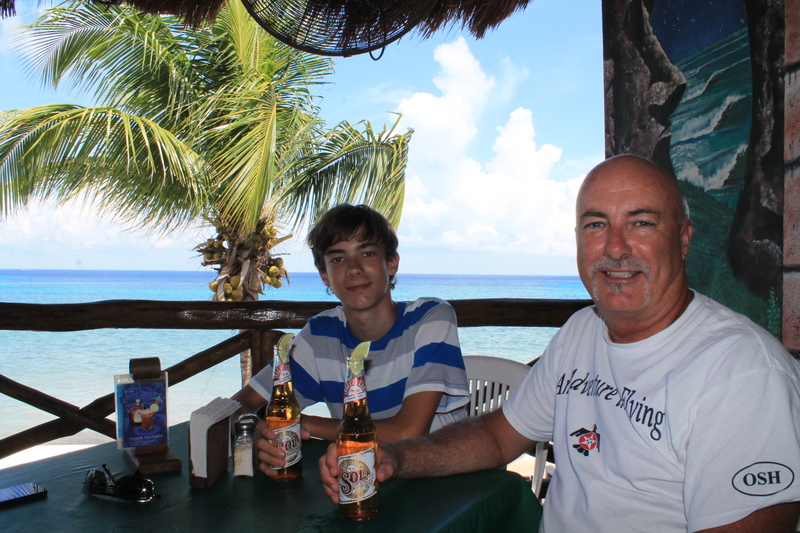 Needless to say, as they were leaving the beach he realised that his glasses were at the bottom of the Roatan sea! When I eventually saw her at about 5 o’clock, she tried to tell me a story about something or other but it just came out in giggles and a couple words here and there. She then ‘fell asleep’ on the bed for a couple of hours. Dad and I met up in the casino, and hit a couple slots. Once again, no luck. It was late now, 7:15 and we had forgotten about supper, but Cameron hadn’t and he had gone to the dining room by himself and had supper by himself. Could you imagine! It was formal night as well as he was dressed up and all by himself! The great waiters looked after him which was a plus. Anyway Mom and Dad went for supper later and I had a low key supper at the buffet. 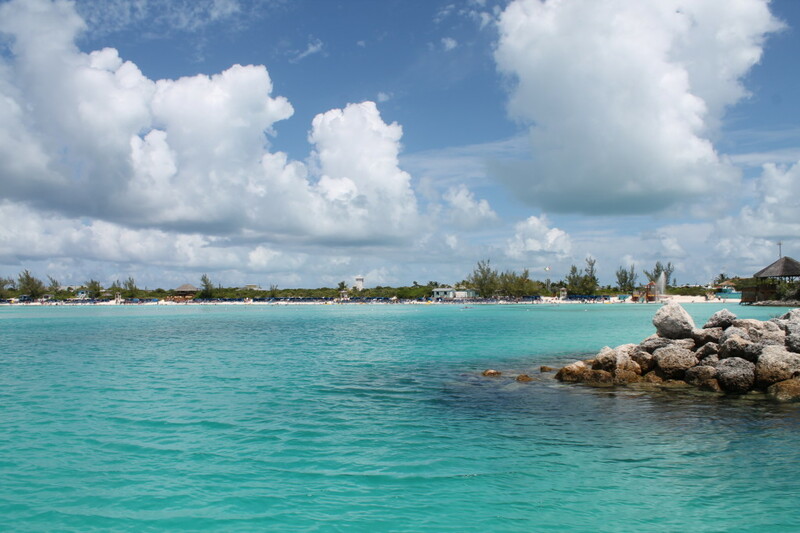 Today was also a tender, and as we had been to the Cayman Islands before, we knew what to expect. 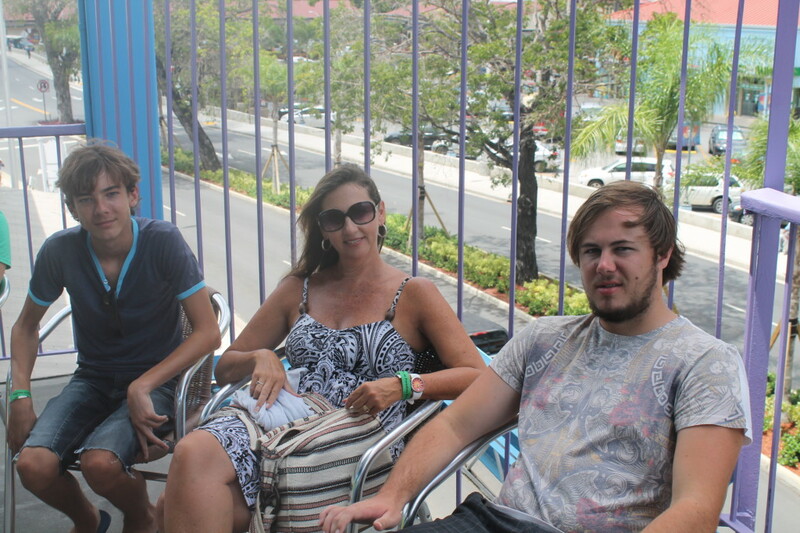 We took a tender into town, then walked around all the shops, had a nice drink at a roof top bar/restaurant. We walked around a bit more, there were more perfume shops than what we remembered. Once we had walked around until about 1:30, we went for lunch at a restaurant we had been to before, we loved it so much we had to come back again – right on the beach. Prices weren’t that bad either, but the reason we returned is because of the location, its on the sea edge, on some rocks overlooking the cruise ship. 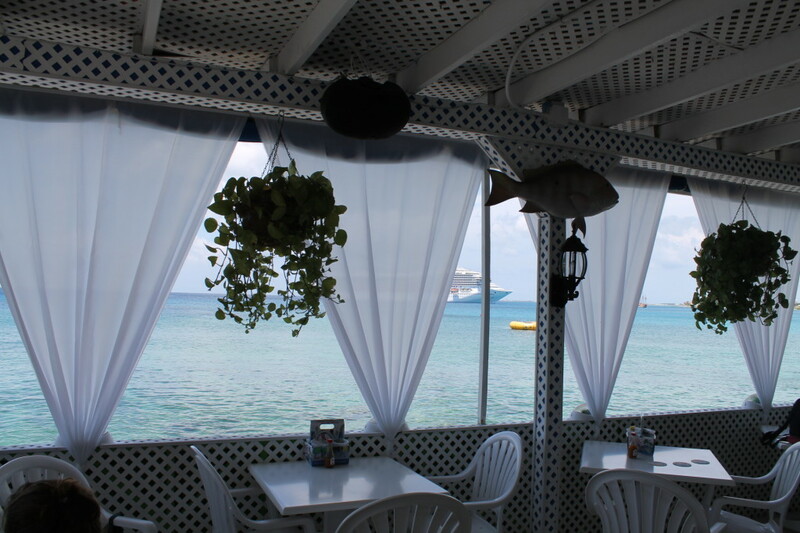 Once we had finished lunch, we walked back to the port, stopped at a rum cake shop, before getting back on the tender and back to the cruise ship. 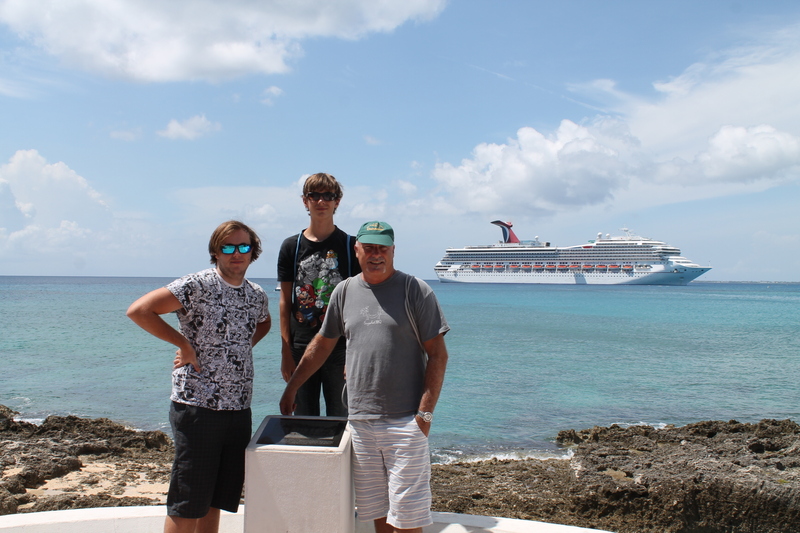 This was the last day of the cruise, we had a very relaxing day, nothing exciting happened. We chose our photos that we wanted to keep. Cameron said goodbye to his new friends that he had made and we packed our bags. 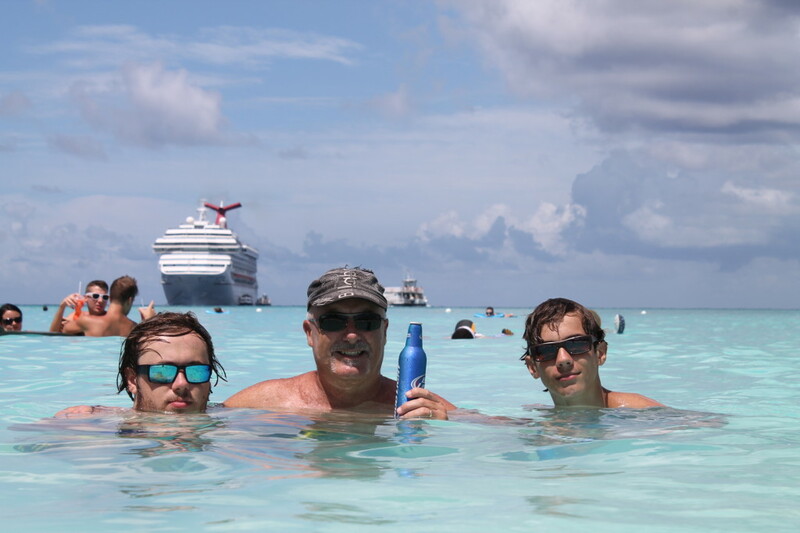 Reflecting on these two weeks, both Cameron and I are really grateful for them and thank our parents greatly for taking us on another cruise. Russell: It was not all plain sailing from an admin point of view these last 14 days. I received an SMS from Standard Bank Mastercard division card to say that there were possible fraudulent activities on Liz’s card. Ended up being about R30 000 being spent at Builders Warehouse and paint shops back in South Africa. Not sure how this happened as Liz had not used her card in South Africa for over 5 months now. Anyway, thanks to Marcelle and Shireen back at head office, they managed to get this sorted out very professionally. The next day I got an SMS from Diners Club asking if I had spent tens of thousands at Walgreens and other pharmacies here in the USA! Clearly not as we were on a cruise! Once again Marcelle and Shireen were masters and did their bit to get the forms and affidavits sorted. Low and behold, another SMS and my Standardbank card also cloned, to the tune of R20 000. So in a week we had close to R100 000 spent on our cards and it was not us! I am happy to report that both banks sorted out the fraud cases before the debit orders ran so no funds were taken from us at month end (I was a little worried that this was going to be the case!). We are now down 3 cards but hopefully will survive until we get back to RSA. Thanks too to Marcelle and Shireen who spent hours and days communicating with the authorities to get this sorted . Lastly, I do not understand why, when credit cards are a worldwide phenomenon and huge here in the USA, that they do not use the chip options when you use your chip based card here in the States. Surely the chip was created for security reasons and should be used world wide if available? This is obviously how my card was cloned here in the USA as it was a chip card but I have not been asked for my pin at all since arriving 5 months ago! We are now paranoid and have been using cash where we can! Eish! What a fabulous 2 weeks! You all look so tanned and relaxed. Having just watched all your snorkelling “movies” we were reminded of our trip to the Great Barrier Reef and how incredible it was to snorkel there – the sights literally took our breath away! Glynn I will share my Hurricanes with you! Sharing is caring after all!